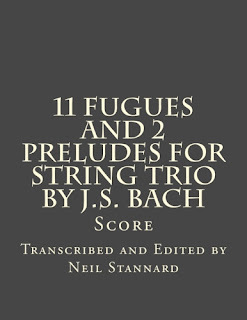 Since many of my readers moon-light as string players, I announce here a new volume of string trios, 11 Fugues and 2 Preludes for String Trio by J.S. Bach. The two books of 24 preludes and fugues in all major and minor keys have become the touchstone for keyboard players desirous of developing a sense of Baroque style. They were indeed conceived originally for a keyboard tuned with more or less equal intervals, but as always in Bach’s keyboard works, their probative value reaches far beyond the mere pressing down of keys in the proper order. Bach sought to teach the complete musician in his Clavier Übung, of which the Well-Tempered Clavier is a part. Übung is translated for our purposes not just as practice in the general sense of learning technique. It also means emersion in the essence of the art, as in the practice of medicine or law. 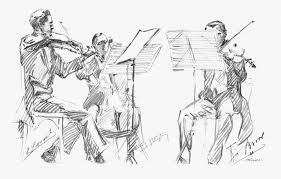 These pieces are about learning composition and a cantabile style of playing, and, in short, how to bring music to life. different combinations of instruments, but also the works of other composers. 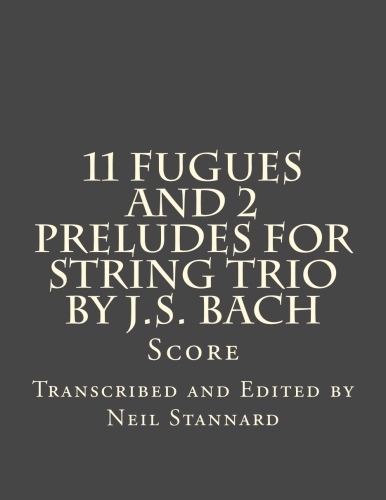 I include here all of the three-part fugues and two preludes from Book I, some of which appear in Bach’s hand in earlier versions and in different keys. This tilted the scales in favor of my offering more amiable transpositions for strings of some of the gnarliest keys. For the intrepid, I have also included those pieces in their original keys. It has been speculated that transcribing works was for Bach a method of study or an effort to make rare compositions more generally available to the public. Possibly. I am more moved, however, by Albert Schweitzer’s assertion that “this was his way and it gave him pleasure.” It is in the latter spirit that I offer here these tasty morsels.